Well hello loyal Legal Highs Guru readers. I would like to tell you all about a wonderfully relaxing scent. I received a 4gm pack of Joker, which has a light blackcurrant scent, is meant to be used in a safe incense burner and in a well vented area for aromatherapy purposes only. Joker arrived quickly, and the entire transaction was professional. Upon opening, the package was packed with four grams of incense. The blackcurrant aroma flowed out of the package, and although it was overwhelming, it was also wonderful smelling. The herb itself has a nice fluffy texture. After inspecting the herb, I decide to put a pinch in my burner and open up the windows. Time to sit back and watch a movie as I wait for the pleasant smell to fill my space! Joker burns like a dream and produces little smoke with lots of smell! It won’t take much to fill your house with a wonderful blackcurrant scent. Look no further than Joker for your air freshening needs, if you give it a try you’ll be very happy with it. 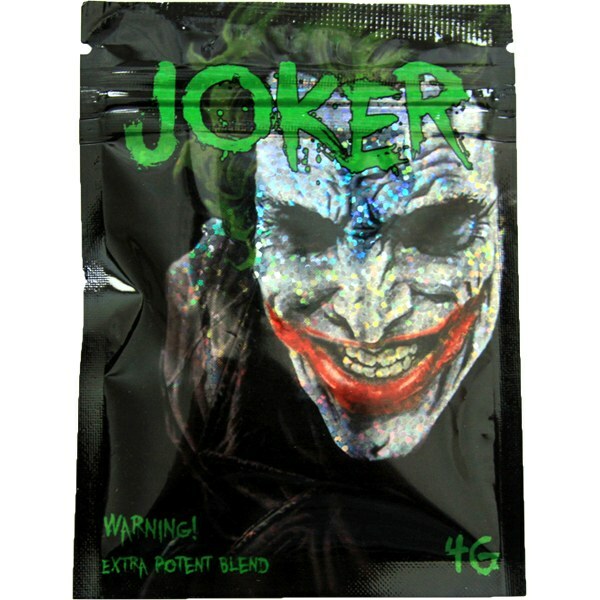 The herbal incense blend Joker shows that there are still some herbal incense left which don’t look and smell like all-natural poop. Basically, I could go on and on about how great this newer company is but it’s just my opinion. But if you’re interested in some fine incense, go try it for yourself. You will not be disappointed. I would dare give it my vote a big 9 of 10 on a new legal blend scale! Loved the new smell and you will too! Have a great day readers. I hope this review helps any and all who are wondering about them. Joker is a must try!